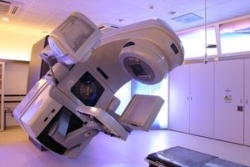 Radiotherapy is not usually used to treat ovarian cancer. It is occasionally used for stage 1c or stage 2 cancers and advanced cancers that are causing symptoms, but most women will undergo surgery and have chemotherapy to treat ovarian cancer. When used to treat early-stage ovarian cancer, it will likely be used after surgery to help get rid of any cancer cells that where left behind. But this can only be performed if there is no sign of cancer in the abdomen and only very little areas of tumor in the pelvis. The reason for this is that to be effective, this type of treatment must be able to reach all the cancer cells that lie within the radiation field. Organs in the abdomen such as the kidneys, liver and small intestine may not be able to withstand the doses of radiation that are needed to kill all the tumor cells. For advanced tumors and recurrent disease, radiotherapy may be used in an attempt to shrink tumors to reduce symptoms such as pain and bleeding. This is known as palliative radiotherapy. The goal of this treatment is to kill cancer cells by delivering a targeted dose of radiation to a precisely defined tissue volume, while attempting to minimize exposure to the surrounding healthy tissues. The way it works is by using high-energy ionizing radiation (for example gamma rays) to kill cancer cells. It can be delivered either by a special machine outside of the body, somewhat similar to an x-ray machine, or by injecting a radioactive chemical that is short-lived into the peritoneal cavity. Each dose of the treatment itself only takes a few minutes to complete, and is not at all painful. Other side effects include the skin in the treated area becoming red, dry and tender. With intraperitoneal radiation, abdominal pain and bowel obstruction (blockage of the intestine) may be experienced. It is impossible to tell who will have these symptoms and to what degree they will experience them. Some people are more susceptible to radiation than others, but by telling your doctor if you have previously had bowel disease or abdominal surgery, measures can be taken to try to reduce the chances of experiencing long-lasting side effects. In addition, your doctor can provide medications to alleviate and help control the side effects.